These fragrances were sent to me free from Dawn Spencer Hurwitz for reviewing purposes. For over 23 years Dawn Spencer Hurwitz has fused her passion for art and perfumery into DSH Perfumes. Today I am sharing some of her most recent autumnal creations, as well as a few others, that she sent along. Matsu- Notes: Bergamot citrus, green wood, leafy greenery and humidity. Japanese for "pine tree," Matsu opens blue green and cool with lime and snowy pine. Austere and serene. As the scent warms on the skin, Japanese cypress, guaiacwood and musk move the nose from the chilled dew drops of the verdant needles to the warm arid heartwood. Smoky scars from fires past smolder within the rings of age at the core of the trees. A stunning scent that I would be pleased to wear all year through, but especially in the winter. Hansa Yellow is one a reviewed in a past Olfactif box, which can be read here. It remains a stunning display of sunny banana, lemon and ylang ylang, carefully blended with the richer ochre and Hansa yellows of vanilla, tobacco and sandalwood. The Voices of Trees- Notes: Coniferous and deciduous trees in deep Autumn. Maple and sycamore leaves, bark, and pine amber. As you know, I cannot walk outside and soak in the vivid foliage of seasonal change where I reside. But I can still imagine the display. Close my eyes and picture the splendor. Inhale the scents of maples, poplars, sycamores and pines all dancing their final flourishes for the year in scarlet and gold trimmed finery. With The Voices of the Trees I can see the flash and hear the susurrus of their dance. Biting air, the slightly tarry dankness from piles of leaf litter, camphorous mountain atmosphere rise and fall with each clouded exhalation. Leaf skeletons lay a mosaic on the forest floor. Amber tears of sap frozen on wounded bark. The Voices of Trees murmur with fragrant breath. Axis Mundi- Notes: Incense with resinous notes and a deep, smoky background. Axis Mundi, the cosmic center where the material meets the celestial. Ethereal threads of gossamer incense twine around the flesh seamlessly. The slightly sweet and holy aroma of frankincense rubbed into the body and soul, perfuming from the inside out. Subtle and diaphanous. Formula X- Notes: The ultimate skin scent. A formula that amplifies your own personal aroma in the form of soft, clean skin. Dawn formulated this fragrance more as a test to distinguish individual's own skin scent then use it as a tool to decipher personal skin chemistry. The popularity of this aroma on its own led her to release it as a fragrance in its own right. And I can see why. On my daughter Formula X smells like a dew drop of morning rain trembling on the tip of a grass blade. On my skin it morphs into a dusky evening in the woods with fog of musk rising from the ground. My husband wears it like a green bamboo forest. The nuances of the differences of these three examples are subtle but present. A lovely fragrance to be sure. Chinchilla- Notes: A "retro nouveau" floriental honey musk, animalic fragrance. A slinky, silky thing glides on the skin. Chinchilla could not be more aptly named, for the plushness of this fragrance imbues the senses with romantic notions of art deco elegance. Burnished bergamot and golden oakmoss bouquets crook their fingers from cognac glasses held with feigned nonchalance in a temporary speakeasy. The pelts of men, women and the sly foxes and shimmering chinchillas they wear breath of leather, seduction and warmth generated by a pulsing saxophone. A lone gardenia riding the waves of pin curls. Shadows blur under the ever constant beat of the candle flames cradled in scones on the damask walls, wax hot and flowing in miniature stalactites to kiss the scuffed mahogany floor. Beeswax, smoky vetiver and the sweet spice of long ago smoked cloves crackle softly in the air. All the while, furry brushes of bodies and velvety textures, tonka beans and civet, castoreum and ambrette seed, simmer on the skin. I am in awe of this beauty. Chinchilla is smoking hot. Kaleidoscope- Notes: A deliciously succulent "vegetable gourmand," citrus to floral, eau fraiche scent. Vegetable gourmand, indeed! Watery cucumber, peppery basil and a squeeze of lime. Cabbage rose brambles frame this cottage garden full of aromatic herbs and quaintly plump vegetables. Spicy marigolds and carnations wear their showy bonnets tucked among the rows. Tall thin stalks of lemongrass bow in the breeze like genteel courters. It is a kaleidoscope of scents, colors and textures all blooming right under the nose. Souvenir de Malmaison- Notes: Spicy carnation and rose meet in an ambery wood fragrance. An exquisite amber rose. I could happily smell like this the rest of my days. A deep burgundy rose, brought into sharper focus by the green tang of carnation. Soft amber and mellow sepia woods provide an elegant setting for this lovely rose to dwell within. Love. All of Dawn's beautiful creations can be purchased in multiple concentrations and quantities, from $6.00 samples to $18 3ml deluxe sprays and $25 one dram miniature flasks to huge 60ml voile de parfum sprays from around $235, but prices do vary depending on the individual scent. I fell hard for Chinchilla, Souvenir de Malmaison, The Voices of Trees and Matsu. All are lovely of course. Do any of these strike a chord for you? Have you sampled DSH Perfumes? Wonderful review! 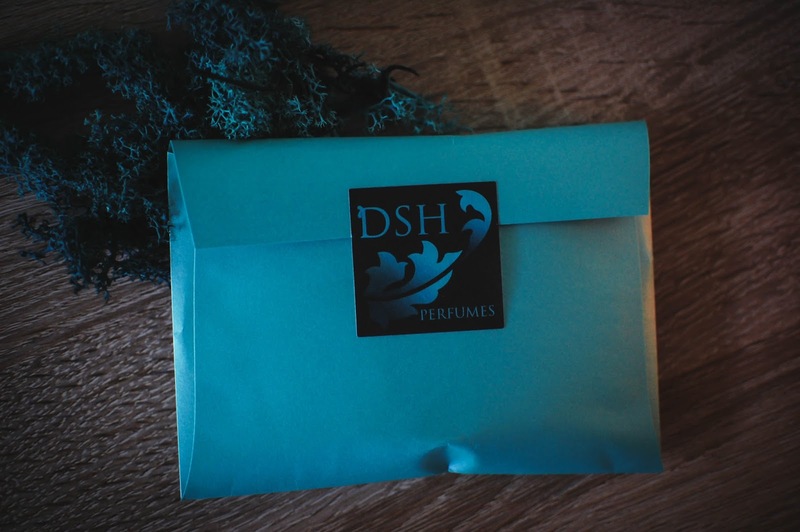 I have never smelled DSH creations. I am particularly drawn to Voices of the Trees and Formula X... Although the Floriental sounds dreamy too. They all sound wonderful! I think you would carry off Voice of the Trees very well, given your fairy heart. It is a fertile beauty. 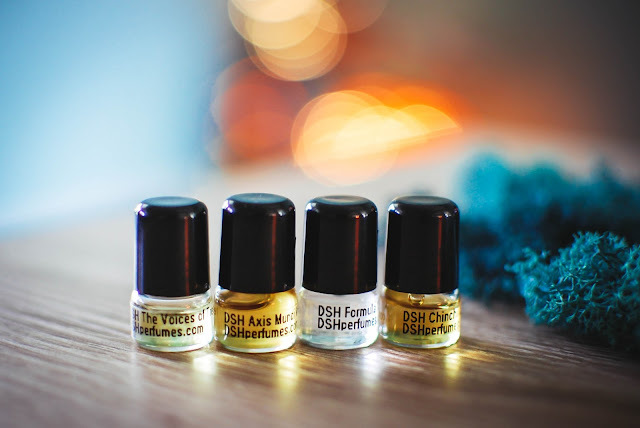 I do believe all of DSH fragrances are all natural. Her fragrance range is pretty impressive. I hope you are doing well Doreen! Have a great weekend ahead.